Dr Paulo Pinho is dental surgeon working in both Melbourne and Sydney. After years working in hospital trauma centres in Latin America and the United States with oral surgeons and other specialists, he made the move to Australia. For his first four years, Paulo worked as a part-time dental officer at the oral surgery department of the Royal Dental Hospital in Melbourne. Dr Pinho is skilled in performing oral surgery under local and general anaesthetic. Dr Pinho quickly identified a real problem in Australia: the high cost of oral surgeons mean patients avoid having vital dental work. So he set out to find a way to provide low-cost, high-quality oral surgery. How does he keep costs down? 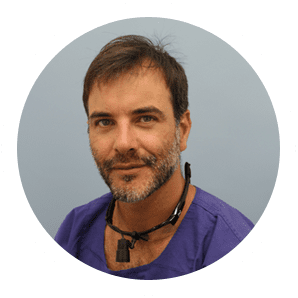 Since receiving his licence to practice dentistry in Australia in 2005 and going out on his own, Dr Pinho has limited his practice to wisdom teeth extraction and dental implants, working closely with other oral surgeons. These two oral surgery procedures are both ones that can help patients with quality of life – and also tend to be more expensive. Because Paulo sees a high number of patients and is adept at quick surgical procedures, he’s able to negotiate better rates, including for hospitals and day surgeries. That translates into more affordable dentistry for you. We understand that both procedures can cause anxiety so Dr Pinho offers ‘sleep dentistry’. You won’t even remember the procedure! Through his surgical career, Dr Pinho has become extremely efficient. He has removed over 20,000 Wisdom teeth and placed over 2,500 Dental Implants in the past 15 years. This means that he can see more patients more quickly, and you won’t wait weeks for an appointment. Why pay more for vital oral surgery? No fancy surgery; just good-quality dental care. In the end, that’s what really matters, right?